It helps when you have Unity engine game. 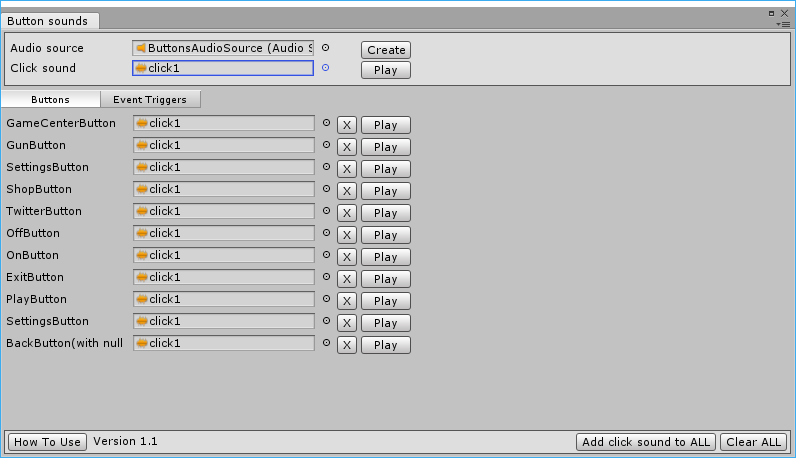 It helps when you use Unity UI and <Button> component for all buttons. It helps when you use EventTrigger with PointerClick event. 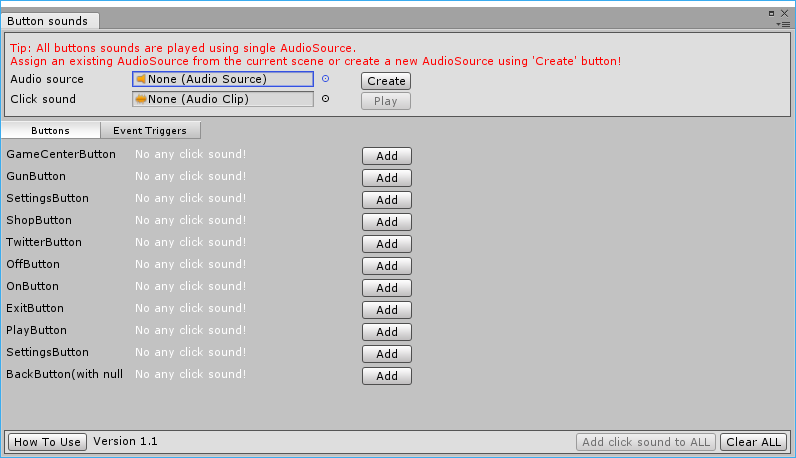 It helps when you have many buttons in the scene and you have to add click sound to them all. It helps when you have to edit click sound for buttons, periodically. Download the latest version of editor from github.com: Button sounds editor. 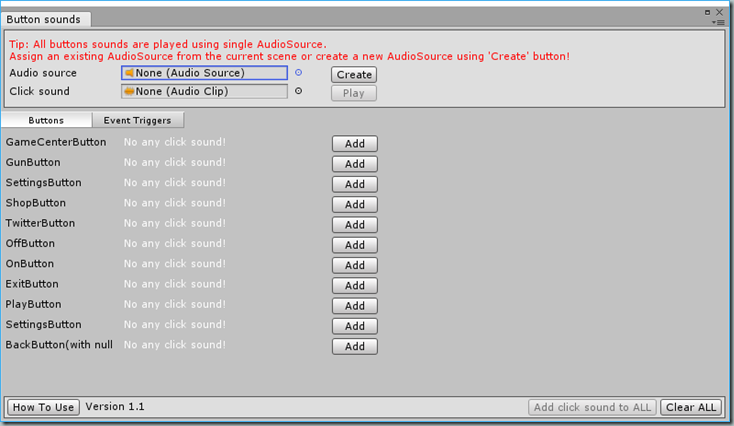 Install <ButtonSoundsEditor.unitypackage> into your project. Open the scene with <Button> or <EventTrigger> components. Editor window will be opened. All click sounds are played using audio source. If you have audio source for this purposes, you can assign it to the <Audio Source> field. Also, you can create new audio source using the <Create> button or manually. Set the click sound to the <Click Sound> field. Click <Add click sound to ALL> button. All buttons have click sound, now. Play the game and test. Editor uses the <Button Click Sound> component with two parameters: <Audio Source> and <Click Sound>. Editor adds/removes<Button Click Sound> component to game object with <Button> or <EventTrigger> component. And passes parameters from the editor window. On <Awake> component subscribes on button click event for <Button> or on PointerClick event for <EventTrigger>. Callback plays <Click Sounds> audio clip, using <Audio Source> audio source in the click handler. Editor allows to assign different sounds to different buttons. Use button’s row for that. Editor allows to play sound, using <Play> button in editor. Editor shows image for the selected button, its text and path to the game object in the scene, for better buttons control in single window.